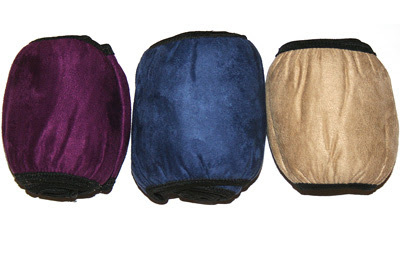 RehaDesign Wheelchair Slippers are now available in three attractive colors! 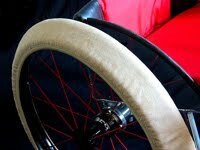 But in case you have not seen wheelchair tire covers before, let's take a closer look at what they are all about. As shown in the video RehaDesign Wheelchair Slippers offers the choice of how to best use your tire covers. These wheelchair tire covers are designed to go over the handgrips to keep your hands clean or behind the handgrips so that you can push the wheelchair as you normally do. RehaDesign Wheelchair Slippers are made from an artificial suede material which is soft to the touch. The inside has a specialized rubbery material to grab the wheels and the handgrips in order to prevent slippage. Now with three colors to choose from, RehaDesign Wheelchair Slippers offer even more choice. No matter what color you select, RehaDesign Wheelchair Slippers are the Wheelchair Tire Covers to use to keep your house and hands clean and free from dirt. And it does not matter where you live. The price for RehaDesign Wheelchair Slippers includes TWO wheelchair tire covers plus FREE shipping by registered parcel post anywhere in the world. Payment is by Paypal, so you know your purchase is secure.